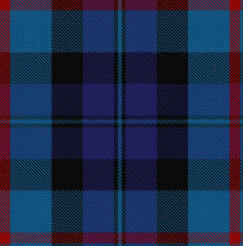 The root of the ancient Scottish name McCorkle is the Gaelic word Mac-Thorcall which was created from the Old Norse personal name Thorketill, meaning "Son of Thorkel." Thor was the Norse God of Thunder. Samuel Matthew McCorkle and his family were living in Scotland during the troubled times of Prince Charles Edward, the Pretender, who tried to seize the Scottish throne. Samuel Matthew McCorkle moved his family to Ulster (Protestant Northern Ireland). There his son Matthew married Jean Givens. The largest number of McCorkles reside in North Carolina, Georgia, Tennessee and Ohio. 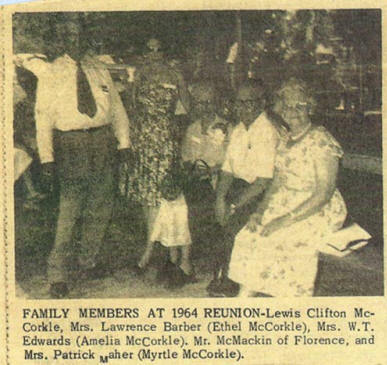 The Loftin family connects to the McCorkle line when Thomas Loftin married Sally Lavinia Beatty, the daughter of William Able Beatty and Isabella McCorkle. 11 Crystal Annette Loftin, b. 10 Paula Tulin Paden, b. + Clarence Bruce Blankenship, b. + Andrea Leigh Morris, b. From what I can tell so far, there were 5 McCorkle “clusters” in what was then Mecklenburg County, listed by the “founding” member: John McCorkle, James McCorkle and Robert McCorkle in the Waxhaw area (now Union Co.), your guy Matthew McCorkle in what is now Lincoln/Catawba Co., and Stephen McCorkle in the Rock Hill SC area. There is also the Alexander McCorkle branch in Salisbury, but that’s far enough away that there really aren’t any conflicts. 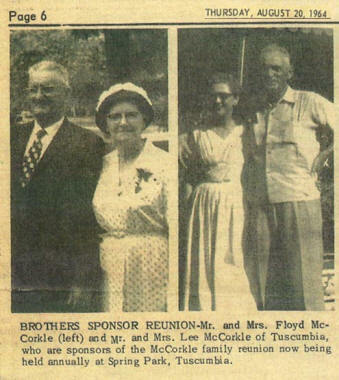 So far I have found no evidence as to how these McCorkles are related, but one has to think they are. 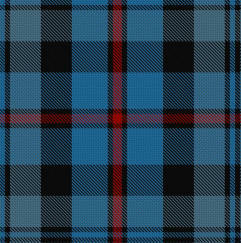 It does appears that all came through Pennsylvania before settling in NC., and all are of “Scotch-Irish” origins. Rev. Louis McCorkle in his “Viking Glory” book speculates that Robert (his line) and James were brothers, but he really doesn’t cover John, Matthew and Stephen. Members of the Lewis Washington McCorkle and Frances Jane Claunch gathered for a family photograph in 1896. 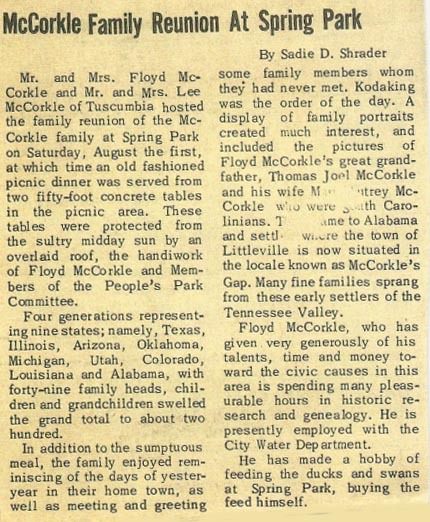 And at 10 a.m. Saturday, 02 Aug, the annual McCorkle family reunion is set at Tuscumbia Spring Park. Members of the family of 1896 were from left seated: Mary Elizabeth Autry McCorkle (Lewis' mother), Mattie Martha Elizabeth McCorkle, Lewis Washington McCorkle, Effie Gertrude McCorkle, Frances Jane Claunch McCorkle, Hubert Drewey McCorkle, Charlie Montgomery McCorkle, Lewis Clifton McCorkle, Amelia McCorkle, Annie Ross Mitchell McCorkle, Frances Ether McCorkle, Myrtle Novall McCorkle. Standing from left: Thomas Albert McCorkle, Lewis Despeze McCorkle, Ada Ann McCorkle, Robert Cullen McCorkle, Helen Angie McCorkle, Ardena Price Chambers McCorkle, Claude William McCorkle, John Lawson McCorkle, Roy Egbert McCorkle and Alice Elizabeth Grissom McCorkle. ** Information concerning Thomas McCorkle's marriage to Martha Greer courtesy of Jill Jobe (and her research partner of many years, Richard Austin Bain). Some sources say that Thomas was married to Sarah Greer. You can contact Jill at jobe.jc66@gmail.com. 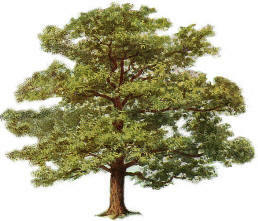 Much of the information in this lineage came from the McCorkle Family Bible in Tuscumbia, Alabama - recorded and shared by Iva Hopper Johnson of Clifton, Texas, in 1997 at the age of 95. 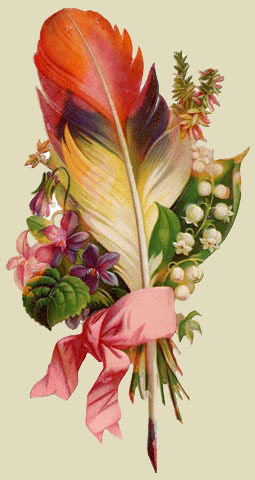 Iva was the granddaughter of Moderna McCorkle Gray who was born in Tuscumbia, Alabama, and buried in Jack County, Texas. Thanks to Clay Blankenship for information on his Thomas Jefferson McCorkle lineage. 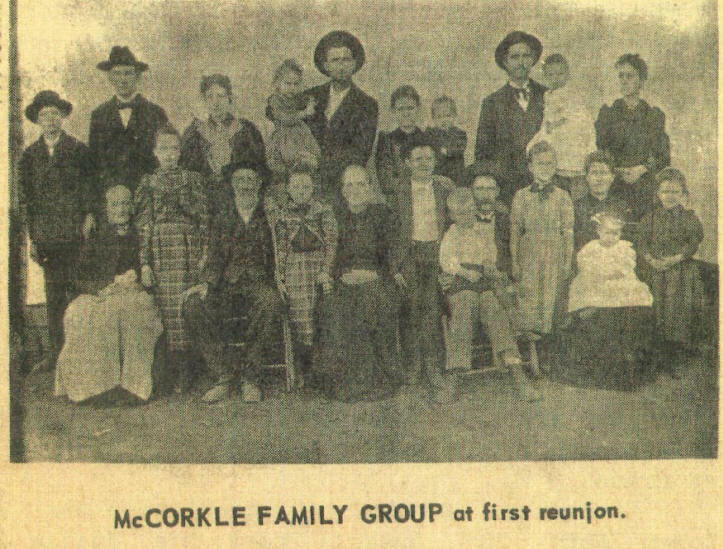 Also, Thanks for the names to go along with the 1896 McCorkle Family Reunion photo in Colbert Co, Alabama. You can contact Clay at clay.blankenship@gmail.com . If you have photos or additional information about the McCorkle family, please contact me.